PURCHASE: The 2019 RHS Yearbook will be available for purchase at www.yearbookordercenter.com. The school code is 14197. Yearbooks ordered by October 31st are $80. Yearbooks ordered on November 1st or later will be $90. Yearbook ads for seniors can also be purchased on that site. Do you know about the free tutoring? Every day during the lunch waves, free tutoring in math and English is offered by RHS teachers in a room near the gym. The teachers rotate through the different waves on different days - you will always find a current teacher available to assist, but it may not necessarily be your child's teacher. In math, assistance is available for students of all levels in all subjects. In English, the teachers can assist with essay writing related to English assignments, as well as social studies (the focus is more on essay structure and less on content). The tutoring is available on a drop-in basis - no appointments are needed. Student may also receive tutoring by appointment during free periods subject to teacher availability. What are the late buses? When do they run? There are two late buses that run every day, Monday-Friday, at 4:30pm and 5:30pm. There is one bus for the north side of town and one for the south side. Students should confirm that they are on the right bus! The routes and stops are not fixed - they vary each day depending on the number of students on the bus and where they live. 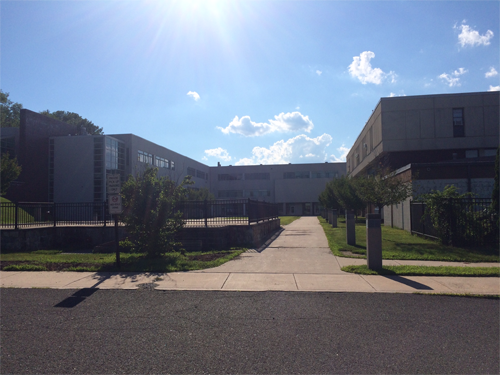 Students should go to the Community Entrance (see below) before departure time if they want to ride one of the buses. What do I do if I need to pick up student mid-day for doctor's appointment? Call the attendance office in the morning and let them know what time you will be picking up your child and whether/when you will be bringing them back. Your child will stop by the attendance office window and sign out. 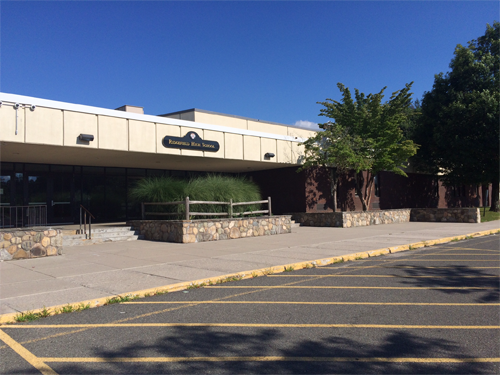 Pick up your child at the Flagpole Entrance (see below) - you do not need to come into the building. How do we pay Destiny (library) fines? Your child must pay any library fines (for overdue books or Chromebooks) at the Library Learning Commons. All fines must be paid in order to buy tickets for dances, proms and most Senior Year events. Email reminders will be sent periodically to the student and the primary parent (as identified in PowerSchool). Does my student need to have his/her own laptop? Students in grades 9 and 10 are required to bring their school-issued Chromebook or personal device (laptop, Chromebook, etc.) to school each day. Students in grades 11-12 are not required to bring their own laptops to school. Chromebooks are available for check-out daily usage in the Library (they must be returned at the end of the day). That being said, the number of Chromebooks available is limited, and students cannot be guaranteed to have one available when needed. Many students do have their own laptops and bring them to school as needed. What is the yearly sports pass? Students and families may purchase annual RHS Sports Pass through the RHS Athletics Department. The cost is $25 for RHS students and $40 for adults. Senior citizens who have the Ridgefield Senior Gold Card are free. Order forms can also be obtained from the athletics office or SLO (Student Life Office). The pass gives holders access to all regular season games held on RHS campus (Tiger Hollow or the gym) without the need to pay the entrance fee. Ordinarily, RHS students would pay $5 to attend each football or basketball game, so if your child attends a couple each year, it's worth it. Also, children aged 10 and under or are wearing their youth club jersey are free at football and basketball games held at RHS. Passes cannot be used for Boys/Girls Ice Hockey or any FCIAC/CIAC tournament games. 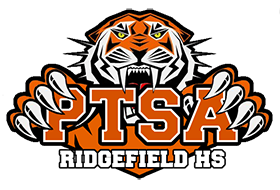 How can I get something on this website or in the RHS PTSA Tiger Link blast? If you would like to submit something for the weekly blast or PTSA website the guidelines for submissions are below. Articles must be emailed to ridgefieldhsptsa@gmail.com by Friday morning12:00 pm for inclusion in Sunday's blast. Articles should have the title in the subject of the email with date to be included. The article content should be in the body of the email. If you have multiple articles please email them separately. Please submit articles exactly as you wish them to appear in the eblast. Text articles should be typed either in Word DOC attached to the email or in the body of the email. Images should be in either .jpg, .png, or .gif format. If you wish the article to be in more then one issue, please note when you would like it to stop running. How do snow days and shortened days impact scheduling? At RHS, letter days (A-H) are assigned to the calendar at the beginning of the school year. Those letters can be seen on the calendar on the RHS Website at any time. Unexpected closures, delayed openings and early dismissals impact that schedule in different ways. 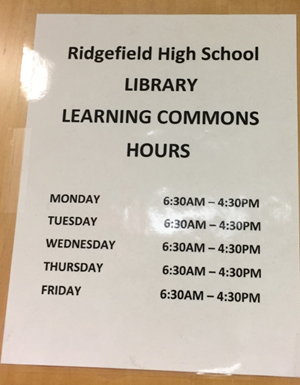 The school has developed an RHS Bell Schedule document outlining the information below. Snow Day - The letter day is skipped. Whenever students return to school, it will be the originally-assigned letter day for that date. For example, Monday is an A Day. It snows overnight, and school is cancelled on Tuesday (a B Day). When school resumes on Wednesday, it will be a C Day. Delayed Opening (2 hour or 3 hour) - The previously-assigned letter day remains, and all classes for that day are held in the usual rotation for a shortened period. Lunch is served. Unscheduled Early Dismissal (announced prior to the start of school but not on calendar) - The previously-assigned letter day remains, and all classes for that day are held in the usual rotation for a shortened period. Lunch is not served. Holiday Planned Early Dismissal (such as day before Thanksgiving day) - No letter is assigned to this day on the calendar. Every section (1-8) meets for a shortened period. Lunch is not served. Professional Development Planned Early Dismissal - No letter day is assigned. Students will have 4 regular-length classes. For the 2018/19 calendar each day has 4 different specifc sections what will meet. For a list of these sections by date, see Early Dismissal Meeting Patterns. No lunch service is provided. Emergency Dismissal (power outage, water main breaks, etc.) - The previously-assigned letter day remains. The number and length of periods will depend on the nature and timing of the emergency necessitating the dismissal. In some instances, a limited number of full-length classes may be held; in some instances, shortened classes may be held; in other instances, the students may be required to remain in whatever class they are in at the time the dismissal is called. We are keeping a list of tips on where to find information and how to use our PTSA website. Please check it out. Dropping off in the morning? 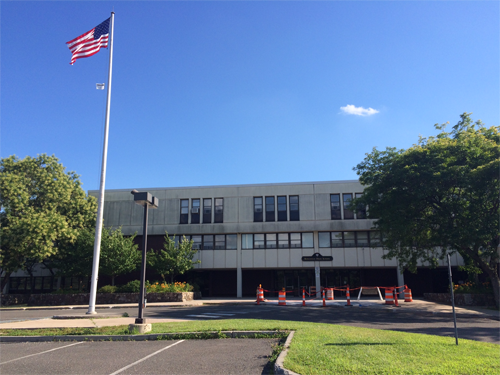 Use the Main Entrance (aka - "Flagpole Entrance").